1. 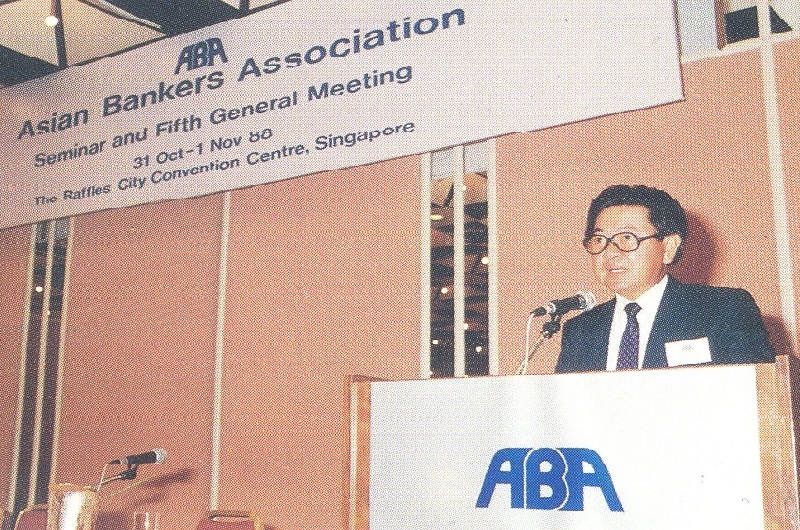 The 5th General Meeting of the Asian Bankers Association, which included a Seminar that had for its theme “The Recycling of Japanese Funds: Strategic Implications on Banks in Asia and Asian Economies”, was held on October 31 – November 1. 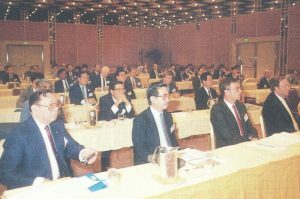 1988 at the Raffles City Convention Center in Singapore. 2. Some almost 100 participants from some 50 banks in 9 countries attended the Meeting and the Seminar which were officially opened by Honorable Dr. Richard Hu, Minister of Finance of Singapore. 3. Dr. Hu spoke on capital flow and global interdependence and the substantial gains both investors and recipient countries will reap. “It is precisely this relationship between Japan and the countries of the region that is needed to herald in the Asia-Pacific region. There has to be additional invest­ments and therefore a need for additional savings, particularly, Japan’s savings,” he said. He then answered the questions of whether the recycling of Japan’s surplus to the region has been happen­ing, and if there is anything that can prompt even more advances on this part. 4. Dr. Amnuay Viravan, Chairman of ABA, presided over the morning sessions of the Seminar. Mr. Patrick Yeoh, ABA Vice Chairman, took over in chairing the afternoon sessions. 5. Dr. Viravan talked on the impact of Japanese funds in Asia and explained the choice of the subject for the Seminar. 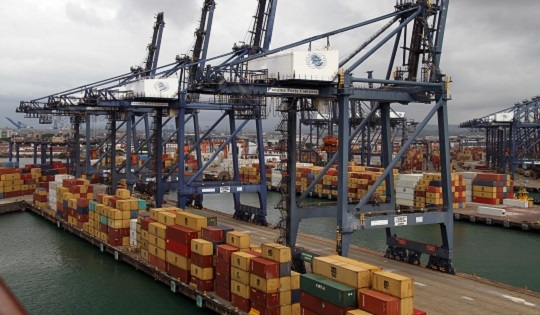 “Indeed, the recycling of Nippon export dollars will have tremendous economic and political impact on world economy in the 1990s as much as or more than the recycling of petro-dollars in the 1970s and the 1980s. It is not unreasonable to assume that the countries in Asia and the Pacific will be the major beneficiaries of the recycling of Japanese funds which will take many forms, namely: direct equity investments, loans and development assistance,” he said. He also expressed heartfelt thanks to Dr. Hu for his kind support and the honor of performing the opening ceremony. 6. In his keynote address, Mr. Takashi Hosomi, Chairman of the Nippon Life Insurance Research In­stitute, focussed on two main channels through which Japan can recycle its surplus funds, namely, through Official Development Assistance and capital outflow via the financial markets. He also stressed the role the government and private sector can play in this recycling process. Mr. Hosomi observed that the need to recycle Japanese surplus funds will continue into the foreseeable future. This is because not only Japanese savings will remain high but also Japan’s global trade and current account surpluses, though expected to decline, will stay high in absolute terms. 7. Mr. Koji Kashiwaya, Deputy Director General for International Finance Bureau of the Japanese Ministry of Finance, emphasized that the most important characteristic of recycling surplus funds is the pivotal role of the Japanese Government, the primary objective of which is to finance indebted countries in order to achieve sustainable growth. He highlighted that in 1986, the Japanese Government initiated a recycling program under which a total of US$30 billion would be channeled to less developed countries by 1989 to alleviate the debt problem and promote economic development. To date, US$23.6 billion has been committed. 8. Mr. Michihiro Sekiya, Managing Director and Deputy Chief Executive of International Banking Group, Mitsubishi Trust and Banking Corporation, stated that the Japanese banks have strong connections with many leading business corporations, and are in a position to provide valuable information to Asian countries and perform the role of a coordinator for these corporations. Further, with Yen funds playing a greater role in Asian economies, there is a need to manage and control foreign exchange risk through the use of Tokyo’s financial market. Japanese banks can help provide such financial know-how. 9. Country reports were also presented by Mr. Colin E. Beard of Australia; Mr. Tae-Sik Hong of Korea; Mr. D.E. 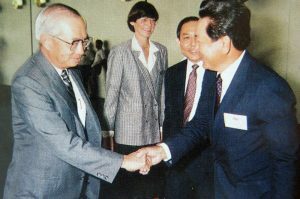 Robb of New Zealand; Mr. Cesar A. Rubio of the Philippines; Mr. Rienzie T. Wijetilleke of Sri Lanka and Dr. Nimit Nontapunthawat of Thailand. 10. A panel discussion was held by all the speakers coordinated by Mr. Patrick Yeoh. The full text of all the speeches are reproduced in the Vol. IV, No. 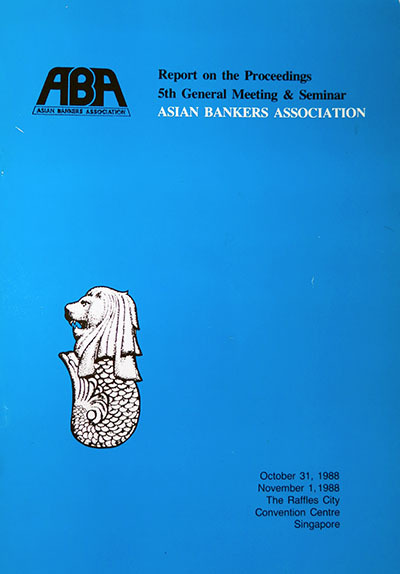 12, 1989 issue of the ABA Journal of Banking and Finance. 11. In his concluding remarks, Dr. Viravan pointed out that there is a consensus view among ABA member countries that Japan, as a major economic and financial power, has the strength to take on a leadership role in addressing global economic problems. For the Asia-Pacific economies, Japan will continue to serve as a main engine of growth through trade investment and development assistance. 12. The 5th General Meeting proper was held on 1st November starting with a report of the Chairman, Dr. Viravan, on the activities of the organization for the past two years. He pointed to the progress of membership expansion, the holding of seminars, the improvement of publications, the amendment of the Charter and the financial situation of the organization. His statement is reproduced as Annex 1. Mr. R.A. D. Nicolson, Australia & New Zealand Banking Group Ltd.
Mr. Philip W. Deer, Westpac Banking Corp.
Dr. I.S. Sun, Bank of Taiwan / Mr. Kenneth Lo, China Trust Co., Ltd.
Mr. Thomas M. McKeon, Citibank N.A. Mr. David K.P.Li, The Bank of East Asia Ltd.
Mr. Tatsuku Aoki, The Mitsubishi Trust & Banking Corp.
Mr. Armando Medina, Rizal Commercial Banking Corp.
Mr. George Ty, Metropolitan Bank & Trust Co.
Mr. Peter Seah, International Bank of Singapore Ltd.
Mr. Heinz Jungjohann, Dresdner Bank, A.G.
Mr. R.T. Wijetilleke, Hatton National Bank Ltd.
Mr. Chatri Sophonpanich, Bangkok Bank Ltd.
14. During a break in the General Meeting, the Board elected from among themselves a new Vice Chairman. Mr. Tetsuya Horie, Deputy President of the Long-Term Credit Bank of Japan, was unanimously elected to this position. 15. Both Mr. Patrick Yeoh and Mr. Tetsuya Horie assumed their posts as Chairman and Vice Chairman respectively. 16. Mr. Patrick Yeoh, in his speech of acceptance , said he was honoured with the position entrusted to him and his Bank, thanked the members of the Council for their faith and confidence, and con­gratulated the new members for their election to the Board. He praised the outgoing Chairman, Dr. Viravan, for his efforts and achievements during his term. 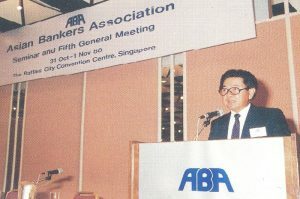 He pledged that with his new team, he will look into the programs that will best advance the objectives of the Association, those that will facilitate the flow of views and information in the banking industry which will provide a forum for bankers in an atmosphere of fellowship and friendship, and those which will promote joint efforts among members in reviewing the financial needs of the economies they operate in. He sought the cooperation and support of an active membership. 17. Mr. Tetsuya Horie, in his assumption speech, pledged to cooperate with the officers and members of the Board in keeping the Association on its path to promoting economic development of the region through a higher level of cooperation in mutual studies and exchange of information. He also pointed to the efforts at securing new members and sought cooperation in reaching a goal of expanded membership. He stressed the need to get together periodically to keep up with the effec­tive role of financial institutions in the further development of the region. 18. Under a resolution of the Board, Mr. Patrick Yeoh presented a Presidential Service Award plaque to Dr. A. Viravan for his involved services and distinguished leadership of ABA as Chairman for 1986-1988. 19. The members agreed to have their next General Meeting and Seminar in Indonesia in 1989 and in Japan in 1990. 20. On a motion duly seconded, a vote of thanks and appreciation was extended to the Development Bank of Singapore and their officers and staff, to Dr. Viravan and his staff at Bangkok Bank and to the ABA Secretariat for the splendid arrangements and preparations of the Meeting and the Seminar. 21. The meeting adjourned at 12:00 noon. A Farewell Luncheon followed.